The NERC (National Environment Research Centre) has funded independent research by a group of university academics into the NO2 air pollution. Heathrow has not paid for it. They have been using a larger number of pollution sensors, in different places, to contribute scientific data on levels of air pollution. They hope to be able to distinguish between NO2 from Heathrow itself, and from road traffic or that blown in from elsewhere. At several sites, the levels of NO2 are already above EU limits (40 µg/m3 over a year). The aim of the research is to test models to ensure they accord with reality. Past work done for the Airports Commission relied on estimates, whereas this latest work used more accurate, real-world measurements. The research is ongoing and there is no report yet, but it is likely that in a month or so the findings will be submitted to one or other journal, for peer review before publication. The study is on NO2 and has not looked at particulates in the same detail. One of the authors said the study does not say anything new – it is merely looking at the situation in an independent, purely scientific way, rather than (as has been done in the past) just extrapolating and predicting by modelling. The existence of the work, is being interpreted by others to mean that air pollution from road vehicles will reduce (less NO2 from new diesels, and there will be more electric vehicles) in future, so a 3rd Heathrow runway might not lead to illegal NO2 levels. The authors say they have just done research – interpretation is for others. New, independent research seen by the BBC suggests Heathrow airport could build a new runway without breaking European pollution laws. [Personal communication with one of the lead researchers: The results are not yet in any form of report. They were in a presentation, seen by the BBC among others. The research is not yet concluded, and may take another month or so. The findings will then be submitted to one or other journal, for peer review before publication. The study is on NO2 and has not looked at particulates in the same detail. The author said the study does not say anything new – it is merely looking at the situation in an independent and purely scientific way, rather than (as has been done in the past) just extrapolating and predicting by modelling. The previous predictions of air quality have been written in an arcane way, very difficult for the layperson to understand. The study is funded by NERC]. The study measured poisonous nitrogen dioxide (NO2) levels using 40 sensors in and around the airport. It then used modelling to predict what would happen in the future. Ministers will decide within weeks whether to enlarge Heathrow or rival Gatwick and the environmental impact will play a big part in that decision. The work was led by the University of Cambridge and has no formal links to any airport or the government. In other words, it comes down to traffic on the roads, rather than planes in the air, because that is where the bulk of the poisonous nitrogen dioxide gases come from. As new, cleaner car, lorry and bus engines become more common, pollution levels should decline, wiping out any increase from a bigger Heathrow. Prof Jones said using lots of smaller sensors, dotted in hard to reach places, gave them a clearer picture of what was going on. “By deploying a network of sensors we can tell directly from the measurements, what’s been emitted locally from Heathrow airport and what’s been blown in, mostly from central London. That’s the real strength of the sensor network,” he said. Currently, the air has climbed above European health limits at several sites near Heathrow. This work suggests that as cleaner engines kick in levels will fall again. It is a conclusion that tallies broadly with previous research for the government, but that research relied on estimates, whereas this latest work used more accurate, real-world measurements. Opponents think air quality is the Achilles heel for Heathrow expansion and could be where it is challenged in the courts. That is what happened the last time they wanted to build a third runway. This latest, million-pound research was funded by the Natural Environment Research Council (NERC) and alongside Cambridge, experts from the universities of Manchester and Hertfordshire, Imperial College London, CERC Limited and the National Physics lab where involved. Heathrow helped them put the sensors up and British Airways provided some flight data, but neither handed over any money or were involved in the actual work. Last December, the government told the BBC it had to go away and double-check a few things before making a decision, claiming it was “subject to further consideration on environmental impacts and the best possible mitigation measures”. I have asked, but they won’t tell me what they’ve been checking for nigh on a year. And I’m not the only one. ….. and there is more on other topics …. http://www.bbc.co.uk/news/business-37566361 and this version was slightly updated later in the day. NERC say “We are supported mainly by the Department for Business, Energy & Industrial Strategy (BEIS)”. Its CEO is Professor Duncan Wingham. Reports on new research have today suggested that Heathrow airport could build a new runway without breaking European pollution laws. “When making the decision on Heathrow the government has a moral and legal duty to protect people’s health and ensure they have the right to breathe clean air. “It shouldn’t base its decision on optimistic modelling at best and a naive view of the car industry that has proven time and time again it can’t be trusted to bring levels of air pollution down. “Last year the UK Supreme Court ordered the government to draw up new plans that would bring air pollution in London within legal limits as soon as possible. Our interest as an organisation is limited to the environmental effects of aviation, which includes the air pollution associated with both aircraft and airports (including surface access for both people and freight). While emissions even at lower levels than those currently legislated for by the EU can harm health, and we support measures to improve air quality around all UK airports, it is only on the roads around Heathrow that emissions are known to consistently breach legal limits. The Government is nevertheless currently considering whether or not to accept the advice of the Airports Commission (AC) to expand the airport – a development that would, the AC admits, worsen air quality compared with baseline forecasts. At the time of the AC’s final publication, such breaches were anticipated to continue beyond the opening date of a new runway, with emissions very significantly over the annual mean NO2 limit of 40μg/m3 . An effective package of mitigation measures beyond those currently anticipated, the Commission says, could collectively reduce NO2 by 2.4 to 3.6 µg/m3 . But this would clearly still leave the Bath Road site significantly in breach of the legal limit. The new figures published with the Defra consultation closing today now anticipate emissions being below 40 µg/m3 at all receptor sites by 2025 – a very marked difference from the previous estimate. 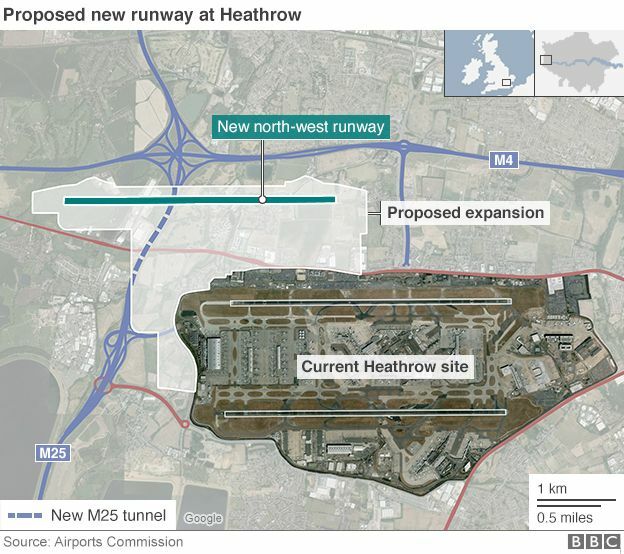 Our concerns about this in relation to the possibility of an expansion of Heathrow airport are follows. 1. We cannot, for the reasons set out above, feel confident in the re-forecast of emissions from diesel vans (which are responsible for a significant proportion of emissions around Heathrow), that are now expected to bring about this dramatic improvement, without further evidence. Our concern is compounded by the fact that significant improvements in air quality around Heathrow have been forecast in the past, and have failed to materialise. (iii) what policy measures, such as appropriate planning controls, will be put in place if the new forecasts turn out to be optimistic. 2. The work presented by Defra for consultation does not include modelling of the impact of a third Heathrow runway on NO2 levels. Even if the new forecasts prove correct and emissions at Bath Road are below 40µg/m3 by 2025, a year before a new runway could be operational the AC estimates, it is clearly very possible that a new Heathrow runway could push them back over the limit. Should the Government announce in December [it did not] that it supports Heathrow expansion, we suggest that this plan and consultation will need to be redrawn to consider the impact of that decision, modelling emissions associated with construction and use of the runway and any associated increase in road traffic. The modelling will need to extend beyond 2030, as the runway is predicted to be operating below its maximum capacity at that point. [so air pollution levels are likely to get worse as the use of the runway increases]. 3. The Airports Commission has argued that the new runway should go ahead even if emissions remain in breach of health-based legal limits and even if expansion would compound the problem, as long as there is at least one other site in London where air quality is worse still, such that the Heathrow project did not strictly ‘delay compliance’. It cites advice from the Highways Agency as following a similar approach in relation to road building. This suggests a potential approach whereby instead of regarding the limit values as an absolute requirement across all areas of a zone, planning decisions could be taken on the basis of a cynical reading of the EU law that allows an increase in harm to public health. The legality of this approach has meanwhile been challenged by Robert McCracken QC in advice to Clean Air in London 2 ( http://cleanair.london/legal/clean-air-in-london-obtains-qc-opinion-on-air-quality-law-including-at-heathrow/ ). We very much hope that Defra will make clear that planning consent should not be granted to a project (a) that will worsen air quality in an area where breaches to either current or likely future air quality limits are already anticipated or (b) where there is a significant risk of it causing breaches to either current or likely future limits. Heathrow has announced a series of environmental concessions, based on those proposed by the Airports Commission, which it hopes will persuade the Government to give it permission to build a third runway. Heathrow claims to go beyond the Airports Commission’s recommendations in some cases. In this article, we look at the key commitments, reflecting what impact they would have on the environmental impacts of a third runway, which the Airports Commission described as ranging from adverse to significantly adverse. We highlighted in our blog following the Airports Commission’s final report that many of the proposed concessions failed to adequately deal with the environmental challenges of a new runway. Airports Commission recommendation: Additional operations at an expanded Heathrow must be contingent on acceptable performance on air quality. New capacity will be released when it is clear that air quality at sites around the airport will not delay compliance with EU limits. AEF has argued that the Airports Commission’s recommendation that expansion should not be allowed to “delay compliance” with the legislation was as a result of an inability to demonstrate that the Heathrow area – which has exceeded air quality limits for many years – could in fact be brought into compliance with legal air quality law if a third runway was built. Rather than accepting the condition proposed by the Airports Commission, AEF believes permission for a new runway should only be given if it can be proven that this is compatible with bringing air pollution in the Heathrow area within legal limits. The issue of whether other locations in London are forecast to breach legal limits should not be used as an excuse for failing to bring the Heathrow area into compliance with the law. Posted: Thursday, October 6th, 2016. Filed in Air Quality, News about Airports, Recent News.